We at McGuire trucking service provide total trucking solutions in Suffolk Counties, Nassau Counties, Queens Counties, Bronx Counties and Brooklyn Counties. If you don’t often use services of flatbed trucking companies, you will be amazed to know what different type of transportation services these top flatbed trucking companies are providing now days. Trucking is the back bone of US economy and providing thousands of new jobs every year. Every client has different set of shipping requirements and not all loads can be shipped through normal flatbed or boxed type trucks. There are some delicate shipments that need to be shipped through specialized air ride suspension trucks. 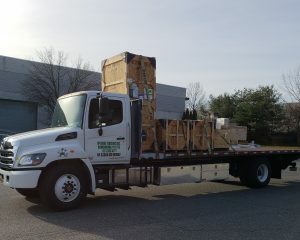 In order to fulfill this requirement, we provide air ride flatbed truck service in Baldwin, Nassau County, NY. 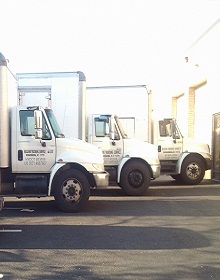 These trucks are equipped with air suspension and absorb the jerks thereby keeping your shipment safe. Shipment containing, glass, ceramic, robotic equipment, costly artifacts etc. are shipped through these air ride flatbed trucks. The demand and popularity of air ride flatbed service has increase over a period of time due benefits these trucks provide. Our Air ride flatbeds in Baldwin NY are simply fitted with high quality shock absorbers so that your fragile load can be shipped without damaging in case of sudden application of brakes or during accident. High quality suspension system provides smooth driving on road without jerks. Our experienced drivers always take precautionary measures and are trained to handle these delicate loads in our air ride trucks. 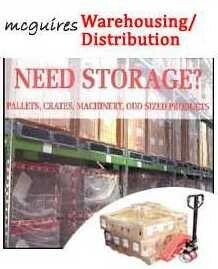 We are just a call away to solve your queries and provide shipment pick up or delivery services anywhere in New York, give our team a call at 631-580-4777. For more details about Air Ride Flatbed, visit our Air Ride Equipped Flatbed Service page. As if our versatility and customer service weren’t enough, our rates are the best, whatever your shipping needs. 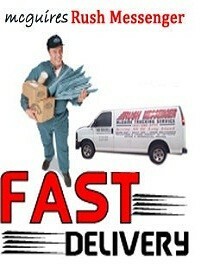 Working with McGuire Trucking Service Baldwin NY is a hassle-free experience all the way around!